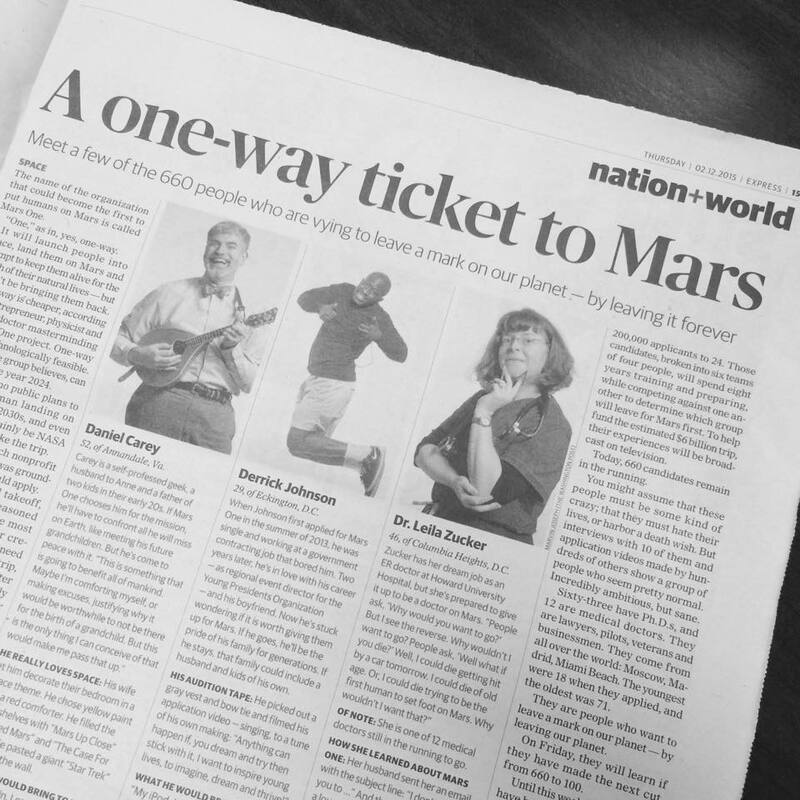 If you were chosen, would you go to Mars knowing that it's a one-way ticket? When I'm not snoring sleeping on the Metro on my way to work, I usually scan the pages of express, a free publication offered to Metro riders. This article (photo below) got my attention. This Mars thing is from a company called Mars One. There were 200,000 applicants interested to go to Mars. Currently, there are 660 people chosen. Tomorrow, it will be reduced to 100. The three people featured below are still in contention. As you can see, one is from Virginia and two are from D.C. They have several reasons why they want to go, but one thing I can deduce is the chance to make a mark. Don't we all want that? Or, do we? Maybe not, but I don't know. When asked what they would bring to Mars? Daniel said he'll bring his mandolin. Derrick his iPod. And, Dr. Zucker said he'll bring her husband, but if she can't bring him then she'll bring her "Looney Pyramids," a deck of playing cards. I love the whole idea of becoming a pioneer and the idea of living in another planet is so exciting. But it also worries me that we've been living on Earth yet we're failing to protect and take care of it. How could we even think of populating yet another planet? I don't know...just my thought. But if given the chance, would I go? No, thank you. You can say that I don't have the spirit of a space pioneer, but I don't like the idea of a one-way ticket to Mars. It's scary. Perhaps this fear stems from those science fiction movies I've seen featuring human devouring aliens and even if there are no hostile, bloodthirsty aliens out there, look at that movie, Gravity, even the character that George Clooney plays dies in space. Call me a coward, I don't care. I don't like a one-way ticket to uncertainty. Not to mention I still haven't explored much of Earth. Besides, I'd miss my family and friends too much. I guess the second question does not apply to me. How about you? Would you go? Why? What would you bring to Mars? Hahaha! NO! I don't want to go to Mars, or the moon. I'm scared of heights and going to either one would require vertical movement so I pass! What I am VERY interested in is time travel :) I would very much love to go back to the MEDIEVAL times. I think I'm in love with that period. I'm doing much better. Thank you. I'm with you. I, too, have fear of heights, but I will take you on that time travel. That sounds more fun, as long as I can come back to my current time zone. Hi Joy, Thank you for hopping over. I agree with you. I'll miss my loved ones as well. You and your movies :). I wonder how they'll get things running up there. I mean with electricity and all. Hi Linda, Thank you for visiting. I'm with you. I don't want to go either. Its a very interesting question. I don't think I'd go if it was one-way. But if it was a round-trip ticket and there were already hostels in Mars, then why not? On the other hand, Mars probably just looks like the Grand Canyon. I agree. I was cringing at the idea of a one-way ticket. If it said, round-trip ticket, I'd be more inclined to reconsider. No, I would not go. When I was young I wanted to be an astronaut but I cannot see myself doing something like that now. You know, when I was a kid, I also wanted to become an astronaut, but then, I was more interested in history rather than the sciences. Oo, ang nakakatakot yong one way ticket siya. I'd be happy to go if it's round-trip.